Nobody hears it and nobody knows the real impact of it. People use sound for exploration, but they are not aware of the massive impact it can have on the wildlife confronted with it. 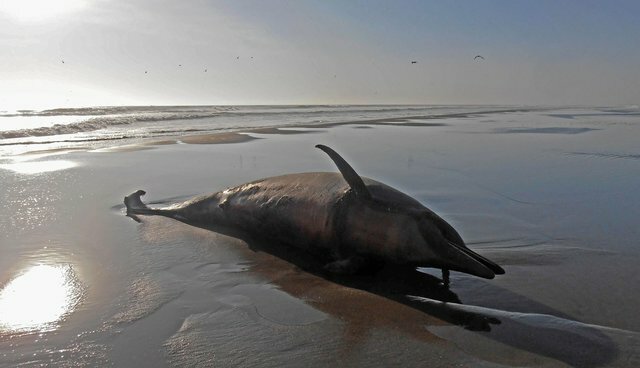 In the beginning of 2012, I saw almost a thousand dead dolphins in northern Peru. The beginning of this year I saw the same. Again over a thousand dolphins died because of one thing: sound. Sound blasts that people put in the ocean looking for things like oil and gas. We don't hear them, but dolphins do and that's why it has a terrible impact on them. They suffer from so-called "acoustic impact" created by the loud and frequent sound waves. Their ear bones explode, their organs fill up with painful air bubbles (decompression sickness), they become deaf and can no longer fish. They are in constant terrible pain until ultimately they die. In 2012, the world didn't listen and the dolphins died silently in the middle of nowhere. Their screams didn't reach the world. This massacre happened again in 2014. Hopefully this time people around the world will stand up against seismic testing in order to save thousands of dolphins in the future. The Peruvian waters are not the only place where sound blasts are killing animals. Sound is used more and more often for exploration and it is important that we point out the dramatic effects it has before it is too late! Please share this important information. Also, it would be really great if you could stand up against seismic testing too by signing the petition in order to save thousands of dolphins in the future!